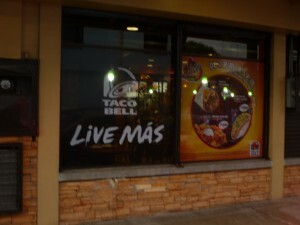 “Live Más” Taco Bell uses Spanglish for it’s marketing in Costa Rica. 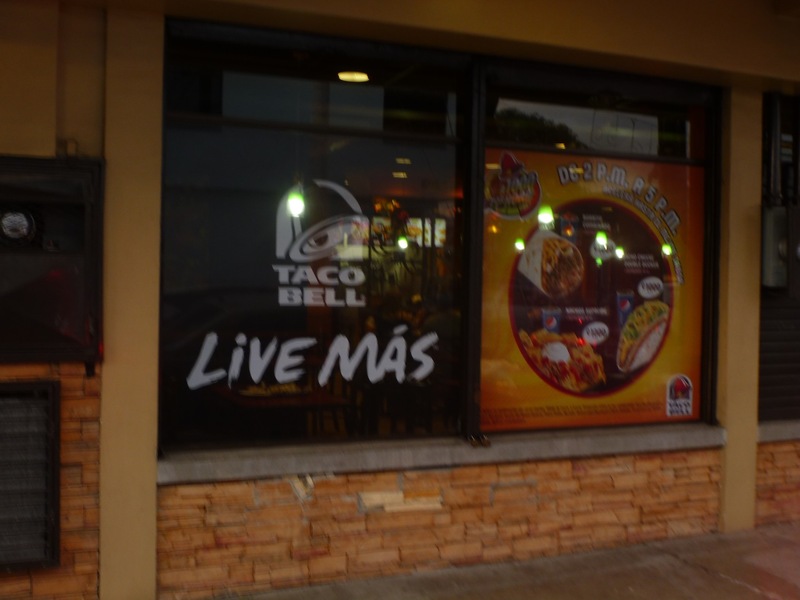 My stomach spotted the man before my eyes did as I walked down the bustly morning streets of San José. He was selling bread from a box that hung from around his neck. On the short-side of the human height spectrum he was dressed in a bright red collared shirt and wore khaki trousers that were too long by several inches. 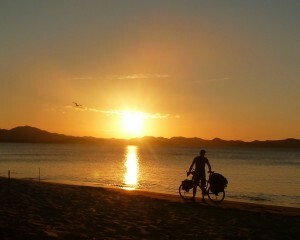 I stopped beside him and greeted him, “Buenos dias. Cuanto vale el pan?” Good morning. How much is the bread worth? I replied smoothly, “Yes, yes, everything is good, thanks. I can’t complain. How ‘bout you?” returning the courtesy whilst repositioning myself to get a better look at the bread he was selling. I was hungry. Were these the rolls that had that sweet cheese filling in them? “I’m all good”, he said with a big smile, as much in his eyes as his mouth. He was bouncing a bit from foot to foot – like a child needing to pee – trying to peer around me. I got the impression he was checking to see if I came with others like me. We made the exchange and he began to chit-chat to me as I ripped into the plastic bag and stuffed half a roll into my mouth. It does have the cheese inside, I thought happily. “So are you studying at the University here?” He asked finally, gently pulling my thoughts away from baked goods and back into the conversation at hand. “I live in Australia” I answered. It is my standard response when I want to dodge the “Where/what is Guam” conversation. He considered this for a second and watched me with a quizzical expression while I started on my second roll. “But you have family here, right?” He asked next. The man spoke quickly and with a strong Costa Rican accent that I had not been exposed to yet. I could understand him perfectly, but to do so was like solving one of those Magic Eye puzzles. You have to focus without focusing. Or in this case, you had to listen without listening. Fortunately, a mouth full of bread gives one that extra half second to process out the garble into clean Spanish. “No, no family here.” I replied, amused by a question that someone with blue eyes almost never gets in this part of the world. “So why do you speak such good Spanish then?”. It’s a question I had already gotten several times in Costa Rica. Probably, I suppose, a result of there being a lot of Gringos in this land of Pura Vida and their not holding the highest level of Spanish. Walking through a touristy marketplace the day before I had gotten a wonderful reception and sincere helpfulness from the stall owners, a reception at odds with what I had heard about the “Ticos” from other travelers. I got the sense that they appreciated my Spanish. Later that same day I got the same question yet again from a woman who started chatting to me on the street and wouldn’t let me leave until she had given me all her favourite “cheap eats” recipes to help make Costa Rica more affordable for me. That said, in Costa Rica there have still been frustrating moments. Like the two old guys selling guavas on the side of the highway that just looked at me blankly when I tried to speak to them. Finally, one of them turned to the other and started translating my Spanish into Spanish for the other and that man then pointed at the juice bag I wanted and held up 5 fingers to indicate the cost rather than telling me “500 colones”. So I tried to give him 50 just to make a point. When these moments take place, I try not to get angry, and I remind myself of the stories my Argentinian friends Martin and Ceci – who I met in Cancun – told me about similar experiences they had been having in Mexico despite being native Spanish speakers. It’s not you, it’s not you, it’s not you, I tell myself repeatedly. But how good or bad is my Spanish really? Being able to write spanish at the level of a 12 year old. Mission Accomplished, I am now fluent in Spanish. Yay. You will have to forgive me though if my elation seems a bit deflated. The fact of the matter is that despite my definition of “fluency” above, I have strong reservations against the use of the big F-word to describe my Spanish skills at this point. I don’t feel “fluent”. I feel like I have climbed the mountain only to find myself standing on the top of a foothill with the real mountain still towering above me. As an engineer, this subjectivity frustrates me. How can I tell I am making progress if I don’t even know where I am? I want to quantify my linguistic prowess on a simple objective 1-10 scale. I want an outside institution to validate my level of “Spany”. I want a piece of paper I can shove into peoples faces and say, “See this here!? This means that YO HABLO ESPAÑOL!”. Fortunately for me, there is such a piece of paper I can obtain, it’s called the Diploma de Español como Lengua Extranjera AKA the DELE. It´s an exam designed to objectively determine a person´s Spanish abilities – the Spanish equivalent of the English IELTS or TOEFL. For a mere $190 to $340 dollars I can pay to spend several hours of my life sitting an exam to acquire a piece of paper that I may never use but is nonetheless internationally recognized by universities, governments, and the ¨business world¨. Who am I kidding? I just want the prestige. So, I just have to take this exam at the first opportunity available to me (May, 2013 in Melbourne, Australia) and then we shall all know the truth! But wait, there is a catch. There always is. It’s not as simple as taking the exam and being told, “Zack your a… 7!”. No, no, no. Instead, DELE have developed six different exams for the six different Diploma Grades (A1, A2, B1, B2, C1, C2) and I have to first decide for myself what level I am, pay to take the highest level I dare, and at the end of it receive a simple “Pass” or “No-pass”. The pass rates often vary considerable by level. For example in November 2011, 77% of the people taking the A1 exam (the easiest level) passed, but only 24% passed the C2 level (the “I’m badass” level). Suffice to say, If I were to end up sitting this exam next year, it would have to be for level C2. Go big or go home baby! So fine, exam plans aside, here I am. I have climbed the foothill only to now see the mountain of fluency towering above me. Don’t misunderstand me, I am very proud of the progress I have made in the last 11 months whilst traveling on a bicycle, but where do I go from here? I clearly still have a lot of work to do and a lot of areas to improve on but the trouble is that I am at the level where continuing to improve whilst traveling is becoming very difficult. I am at the stage where I need to live and work in a Spanish speaking country if I want to keep making leaps and bounds. I am at the point where I really need to find myself a cute South American girlfriend. Or, as an Australian friend in El Salvador put it to me: “Mate, you just need to chase some skirt”. I am now currently listening to the Spanish news extracts, provided by SBS news service in Australia. It is also available for free through iTunes or the SBS website. Pros: Interesting. Pertinent to both Australia and the Spanish speaking world. Covers a wide range of subjects in a wide range of accents. Cons: Often the “extracts” lack any form of introduction so you are thrown into the middle of an interview without having any idea as to the context of the story. Difficult to keep up with the lightning-quick news-room delivery. Sound quality of the interviews can be crackly and poor. I also just discovered – but have not yet listened to – a daily 30 minute Spanish news podcast put out by Voice of America. From the five minutes I listened to I think it will be good, but unfortunately it seems to focus almost exclusively on US national news.